EDMONTON, Alberta (July 10, 2017) – Thousands of volunteers are joining Habitat for Humanity’s 34th Jimmy & Rosalynn Carter Work Project in Canada to build 150 homes in celebration of Canada’s 150th anniversary. Former U.S. President Jimmy Carter and former first lady Rosalynn Carter will build alongside future homeowners in Edmonton, Alberta, and Winnipeg, Manitoba, with additional projects taking place in communities across the country. 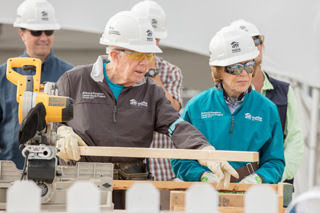 President Jimmy Carter and Rosalynn Carter kick off a week of building with Habitat for Humanity, helping 150 families build places they can call home as Canada celebrates its 150th anniversary. Achieving access to an affordable home is increasingly difficult for many Canadians, with 91 percent saying high costs are the biggest barrier to homeownership, according to a recent survey by PSB conducted on behalf of Habitat for Humanity. Additionally, 1 in 7 Canadian households, including 735,000 children, are in core housing need, according to data from the Canada Mortgage and Housing Corporation meaning that too many families do not have a safe, decent, affordable place to call home. Habitat’s work is made possible thanks to the incredible commitment of our homeowners, volunteers, sponsors, donors and community partners. We would like to thank the many supporters of the 34th Jimmy & Rosalynn Carter Work Project, including: City of Edmonton; City of Fort Saskatchewan; Province of Alberta; Province of Manitoba Manitoba Housing; Dow Chemical Company; Hunter Douglas Canada; Lafarge; Manitoba Liquor and Lotteries; The Rossy Family Foundation; CGC; Edmonton Oilers Community Foundation; Floform; The Home Depot; Kristie Charitable Foundation; Lowe’s; Nissan Canada Foundation; Owens Corning; Qualico; Schneider Electric; Stanley Black & Decker; Stantec; TELUS; and Wall Grain. « Update on Rachel’s New Home, We Are Moving Fast Now…..